The Paul Beckett Poetry Prize has been held annually by the VALPARAISO FOUNDATION since 1999. Its rules stipulate that the prize be awarded to a book or collection of original, unpublished poems written in Spanish, according to the criteria of a judging panel composed of eminent literary figures. The winning book earns 4,000 € and is published in the Beatrice collection. Books from Spain, South America and even several European countries are usually entered. Estábamos hablando de ti by Víctor Manuel Miñano. Este vino antiguo by Francisco Mena Cantero and Al final de los ojos y los labios by José Javier Aleixandre. Soledad compartida by José Luis Martín Cea. Cuaderno de San Bernardo by Leopoldo de Luís. Por una elevada senda by Antonio Gracia. El arte de los sueños by Mariano Altemir and El felino dormido by Francisca Gata. Vivir es ser otro by Juan Van Halen. Leyendas apócrifas de amor y dolor by Jessica Zorogastua. Sucio tango del alma by Óscar Martín Centeno. Sin entrar en detalles, por supuesto by Joaquín Ortega Parra. Tránsito by Marta Policinska and Almas by Antonia Álvarez Álvarez. La luz inversa by Ignacio Arrabal. Los Héroes derrotados by Enrique Barrero Rodríguez. Hacia dónde by Antonio Miguel Mejía. Última campanada del silencio by María Luisa García-Ochoa. Tiempo de balcones by Luis Moreno. Sin tiempo ni añoranza by Antonio Manilla. Vanidades y sueños by María Paz Cerrejón and Tentación Botánica by Elisa Rueda. Frecuencia modulada by Víctor Jiménez. 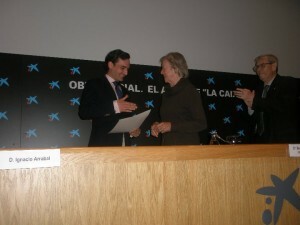 Some of the members of the various juries that have participated throughout the history of the prize have been: Academics from the Real Academia de la Lengua Española (Royal Academy of the Spanish Language) Valentín García Yebra, Gregorio Salvador, Antonio Mingote y and Luis Mateo Díez, as well as Carlos Bousño (Poet, critic and essayist), José Alcalá-Zamora (Poet and professor of Modern History), Santiago Castelo (Poet and Director of the Royal Academy of Extremadura), Carlos Murciano (Poet and winner of the National Poetry Prize), Leopoldo de Luís (Poet and winner of the National Poetry Prize), Fernando Sánchez – Dragó (Writer and essayist), Julio Alfredo Egea (Almerian poet), Francisco Díaz de Castro (Poet, critic and professor of the University of the Balearic Islands), Luís Alberto de Cuenca (Poet and former secretary of state for the Ministry of Culture), Jesús Munárriz (Poet and Director of Hiperión publishing), Jorge de Arco (Writer and literary critic), Ignacio Elguero (Poet and journalist), Margarita Arroyo (Writer, Poet and Francisco de Quevedo Prize winner), Jesús Tomás Mateos de Don Pedro (Poet and board member of the VALPARAISO FOUNDATION), Gonzalo Santonja (Director of Spanish Language for Castilla León), Carlos María Maínez (Poet), Antonio Murciano (Poet and member of the Hispano-American Royal Academy of Cadiz), Santiago de Mora – Figueroa, Marquis of Tamarón (Writer, Ex Ambassador to London and former Director of the Cervantes Institute), Eduardo Serra (Writer, former President of the Friends of the Prado Museum and former Minister of Defence).